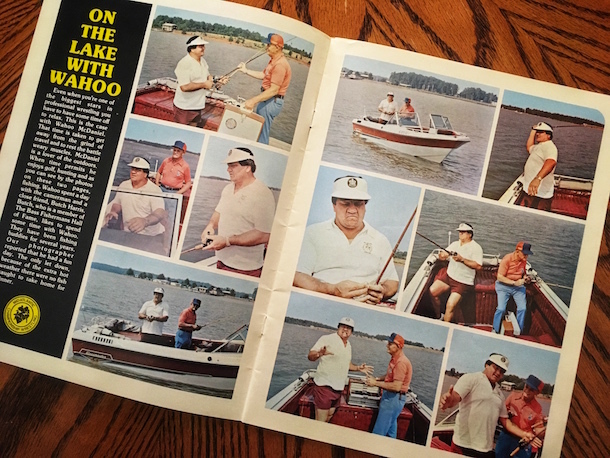 Back in a 1977 issue of Mid-Atlantic Wrestling Magazine, there was a two-page spread titled "On the Lake with Wahoo" that featured wrestling legend Wahoo McDaniel and fishing legend Butch Harris out on the lake for a day of fishing. 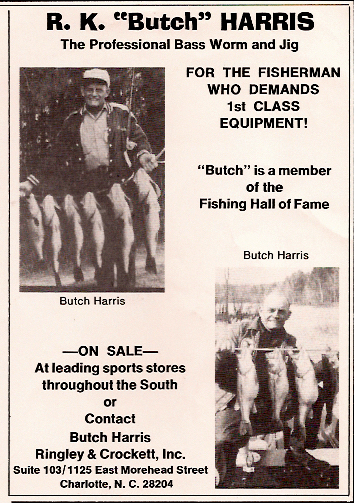 R. K. "Butch" Harris was a hall of fame bass fisherman and ran a business called Butch Harris Bass Lures, which was under the umbrella of Ringley & Crockett, Inc., an arm of the Crockett promotional empire in Charlotte. Wahoo McDaniel, in addition to being a former professional football standout and champion pro-wrestler, was an avid outdoor sportsman in general, excelling at both fishing and golf. The feature in Mid-Atlantic Wrestling Magazine, authored by Les Thatcher, displayed an array of photographs taken during Wahoo and Butch's day on the lake. "Even when you are one of the biggest stars in professional wrestling you have to have some time off to relax," wrote Thatcher. "Wahoo spent the day with close friend Butch Harris. They have been fishing buddies for several years." The advertisement at right is from a 1973 issue of Mid-Atlantic Wrestling Magazine. The info at bottom gives contact info for Butch Harris at the old Morehead Street address for Jim Crockett Promotions and Ringley & Crockett, Inc.
John Ringley explained to us a few years back that Ringley & Crockett promoted everything non-wrestling (concerts, Harlem Globetrotters, fishing tournaments, and other ventures) while Jim Crockett Promotions handled everything wrestling related. After Jim Crockett Sr. died in 1973 and Ringley left the company in 1974, professional wrestling became the sole focus for the company, although the family also owned a minor league baseball franchise. Frances Crockett was baseball's first female general manger, running the Charlotte O's in the mid-to-late 1970s, a Baltimore Orioles farm league team. 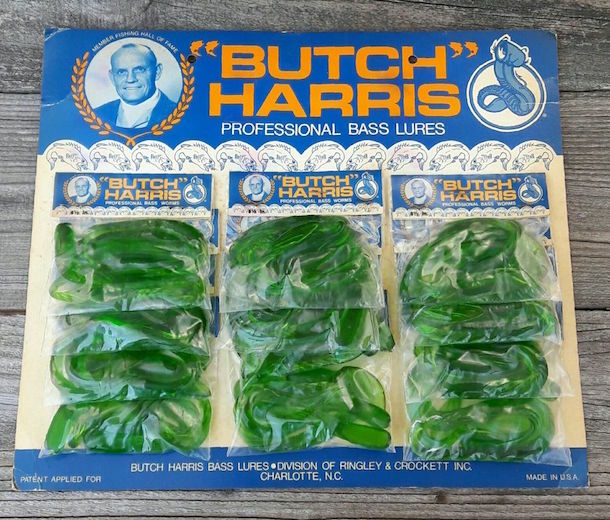 Also fun to come across this old retail counter display of fishing worm lures sold by Butch Harris Bass Lures.At bottom the display reads "Butch Harris Bass Lures, a Division of Ringley & Crockett, Inc., Charlotte, NC."